Assure your clients that you are qualified to provide competent neurofeedback treatment by attaining BCIA certification. As a BCIA approved and experienced mentor, I will provide individualized supervision of your neurofeedback cases to assist you in reaching the level of competency you desire, whether in traditional symptom-based treatment, or QEEG-guided and Z-score neurofeedback. In addition to consultations in my office and online, I currently conduct weekly case conferences at the UTSA Sarabia Family Counseling Center. I regularly teach an introduction to neurofeedback course at UTSA, which provides greater depth and hands on experience than most vendor-sponsored or private practice based workshops. You will find that the cost is competitive and that the state-of-the-art equipment will enable you to receive the preparation you need to further your neurofeedback practice, meet BCIA requirements and prepare for the BCIA exam. The recording is first visually inspected and artifacted, then processed with NeuroGuide and WinEEG software, providing analysis through two different normative databases. The report includes scalp topography (brain maps), spectral analysis, absolute power, relative power, coherence, asymmetry and Low Resolution Electromagnetic Tomography (LORETA). 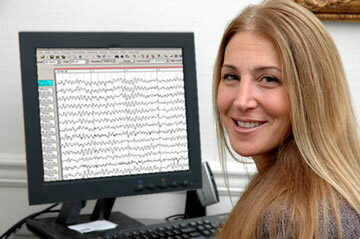 Neurofeedback treatment protocols are then suggested.